JANSSONIUS - Novus Atlas Absolutissimus... Die Wasser-Welt, oder See-Atlas. JANSSONIUS, J. - Novus Atlas Absolutissimus... Die Wasser-Welt, oder See-Atlas. Novus Atlas Absolutissimus... Die Wasser-Welt, oder See-Atlas. - JANSSONIUS, J. Title : Novus Atlas Absolutissimus... Die Wasser-Welt, oder See-Atlas.. Date : Amsterdam, Janssonius heirs, 1657 [after 1664. Size : 20.5 x 12.6 inches. / 52.0 x 32.0 cm. Description : Volume IX (Sea-Atlas) of the "Novus Atlas Absolutissimus". German text, letterpress title on slip within hand-coloured engraved architectural border, heightened in gilt, 39 maps are finely coloured by a contemporary hand. With 6 additional maps by Visscher listed in the index : ("Insulae Americanae", "Insula Matanino", "Novi Belgii", "Indiae orientalis", "Insularum Melitae" et "Insula Candia"). The ‘Water wereld’ was, Koeman states, the “first sea-atlas (in the real sense of the word) printed in the Netherlands”. It was first published in 1650, containing 23 charts and ten historical maps, and formed the fifth volume of Janssonius’ five volume ‘Atlas Novus’. In 1657, Janssonius issued a new, six-volume edition of the ‘Atlas Novus’. For this edition he added nine new charts to the ‘Waterwereld’, removed the historical maps, and reset the text. As well as being issued within the ‘Atlas Novus’, the ‘Waterwereld’ was also issued separately. Even if one accepts Koeman’s comments that “not all [of the maps] should be seen as charts”, and that “the elaborate printed text … is not pertaining to maritime affairs”, the 1657 incarnation of the ‘Waterwereld’, with its large double-page engraved charts, elaborate title, and high production values, should be seen as the progenitor of the Dutch sea atlases produced from the 1660s onwards. In this edition he ads a number of newly-engraved maps and maps published by Nic. Visscher. The atlases were probably made in a very small number of copies and later obviously only made to order. This can explain the variation in letterpress titles and title-pages. When letterpress titles were out of print, the later made-to-order copies have letterpress titles composed by cutting and pasting of words, sometimes even syllables or letters. 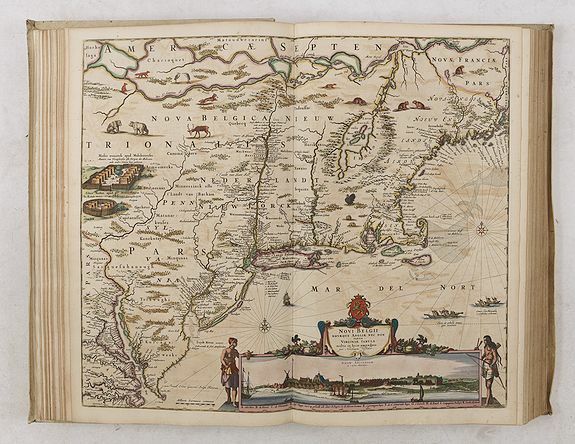 All Visscher maps added to the atlas are extremely decorative, but one of the most important was Visscher's famous map of the New Netherlands, "Novi Belgii Novaeque Angliae Nec Non Partis Virginiae Tabula", included present day New England as well as New Jersey, New York, and Maryland and combines both Dutch and Indian place names. Scattered throughout the map are depictions of native flora and fauna: herons, beavers, wild turkeys, deer, rabbits, bears, muskrats, foxes, and wolves. Stockaded settlements and dugout canoes represent the Indian presence. "Mar di India", covers the area between the Cape of Good Hope and Korea (INS: CORAI) and Japan. It owes its importance to the rendering of the coastline of Australia, which bears the name 'TERRA DEL ZUR'. Of the results of the Carstensz expedition in 1623, only those of the ship Pera on the West Coast of Cape York Peninsula are shown. The results of the voyage of the Arnhem are omitted. The discoveries of the Vianen in 1628 are rendered. Mar del Zur Hispanis Mare Pacificum: the first map of the Pacific to show California as an Island and the earliest map of the Pacific to appear in a Dutch Atlas. From the string of fictitious islands in the South Pacific, to the recently discovered coastlines of Australia and New Guinea, to "Japon" and "Corai" and Terra Incognita in the north. Ref. : McLaughlin 11; Tooley pl 30; Burden 292; Potter p.129; Wagner 359; Leighly pl VI. Tabula Anemographica Seu Pyxis Nautica. . . oder des See-Compasses. . .
Over the centuries, an increased diversity of names for the winds and ambiguity about the direction they came from, produced a multitude of different wind systems. To create order out of the tangled confusion of names and directions, cartographers produced wind roses such as this by Joannes Janssonius in 1650. Thirty-two points (directions) are shown and labeled with various directional names for the winds. But to sailors plying the waters of the open oceans, a wind blowing from Thrace (Thracias) lost all relevance in defining direction. Eventually, the wind rose, overburdened by a multiplicity of names and obtuse symbolism, gave way to the directional system of north, east, south, and west, with their intermediate compounds, as used today. The atlas is bound in very rich contemporary Dutch publisher's paneled vellum, each cover elaborately decorated in gilt in two panels with fillets of broad floral roll tools, large floral inner corner-pieces and central floral cartouche surrounding an armillary globe. Condition : 39 Copper-engraved charts with in very fine period hand-colouring. Original publisher's vellum, paneled in gilt with central gilt arabesques and corner pieces. Some text pages and maps with the usual browning and foxing.